Is It A Good Idea To Pay Villagers Not To Chop Down Trees? : Goats and Soda Governments dole out millions each year. Researchers debate whether the payouts actually work. A new study from Uganda offers some answers. 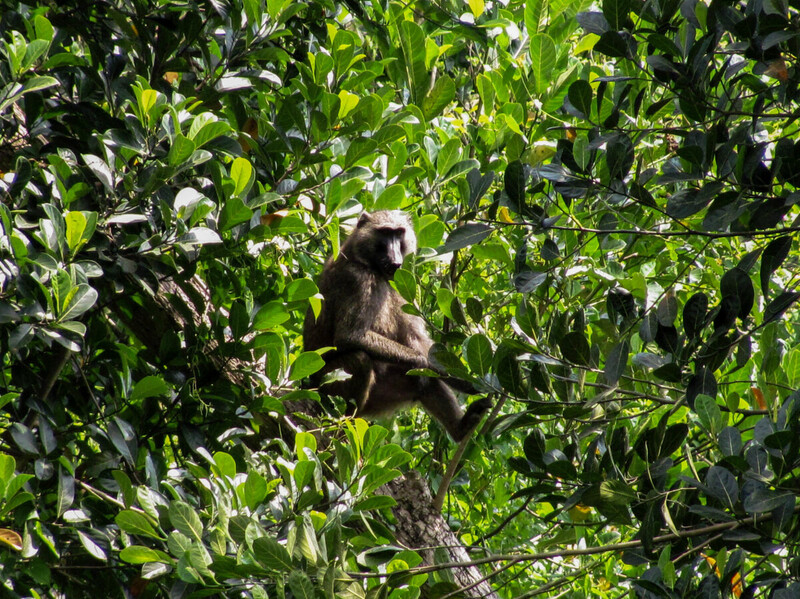 A Ugandan baboon sits in a farmer's jackfruit tree. Governments have struggled to come up with effective ways to stop people from cutting down trees. That's because unchecked deforestation can cause soil to erode, worsen flooding and destroy natural habitats for wildlife. It's become a serious problem throughout the globe. 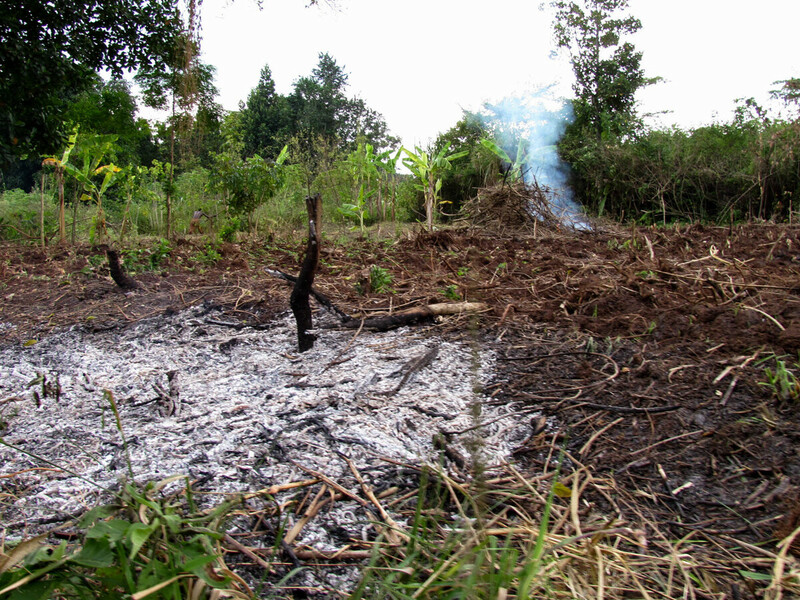 Deforestation accounts for roughly 10 percent of worldwide emissions from burning, and loss of trees reduces the amount of carbon being reabsorbed into the ground. In 2012, Indonesia lost about two million acres of forest, for instance, surpassing Brazil as the world's top deforester. Sometimes commercial enterprises are responsible. And sometimes, it's the people who live on the land. They cut down trees to sell or to use as fuel — or to create additional space for farming. Governments have tried paying these farmers and landholders to save the trees. Millions of dollars are doled out each year. Brazil, Costa Rica and Mexico all have such payment programs — known as "payment for ecosystem services." But researchers have struggled to definitively say whether the payouts actually work. One reason is that people might just take the money even if they hadn't been planning to mow down swaths of forest. And even if there seems to be a drop off in deforestation, no one can tell if it's because of the payments. "There's been a lot of skepticism from economists," says Kelsey Jack, an assistant professor of economics at Tufts University. "Some [past research] had found positive effects and some had found zero effects." A new study published on Thursday in Science reports the best evidence yet that the payout programs can make a difference in reducing deforestation, says Jack, who was not involved with the research. "I think this is a really exciting study," she says. "This really solidifies the research that had suggested these kinds of programs can have positive effects where deforestation rates and poverty levels are high." This Ugandan land was cleared by burning so it could be used for growing crops. One main reason economists are skeptical about such programs is that the programs may not attract people who are actively clearing forest. "You would think people who are signing up [for payments] are those who plan to keep their forests intact anyway. So for them, this is a great deal," says Seema Jayachandran, an economist at Northwestern University and lead author on the study. The new study, done in collaboration with nonprofits Innovations for Poverty Action and the Chimpanzee Sanctuary and Wildlife Conservation Trust, offered a deal to certain villages in Uganda. Landowners who signed up with the researchers' program would receive $28 per hectare of forest for every year they didn't clear trees — that's about two and a half acres. "60 of them received the program, and 61 of them didn't. We randomized which villages received the program," says Jayachandran. In the 60 villages where villagers were offered the payments, a little under a third of eligible landowners signed contracts promising not to cut trees in exchange for the cash. The program ran from 2011 to 2013. At the end of the two years, these villages had cleared about 4 percent of the surrounding forest. But the villages that were never offered the program had cleared about 9 percent of forest. In total, that translates to over 300 hectares of forest saved due to the program. That suggests the payments had just over halved the deforestation rate. "[The program] worked better than I expected," Jayachandran says. After taking into account the amount paid out and administrative costs, the program generates carbon benefits at a rate over two times its cost, based on a carbon value from the Environmental Protection Agency. Because the study looked at both villages that were offered the program and those that weren't, Jack says that makes it easy to attribute the decline in deforestation to the program. "This study does that really well and is able to truly make sure that the causal impact on behavior is this program," she says. But Jack says it doesn't cut through all of the criticisms surrounding these types of payment programs. They're often seen as win-win: Poor people get money and trees get preserved. But people who aren't well-off enough to own land aren't eligible, so some economists make the criticism that payment programs only benefit wealthier individuals, Jack says. Lastly, Jayachandran's program in Uganda only ran for two years. After which, landholders would no longer be paid to keep their forests intact. "I fully expect they resumed deforesting [after 2013]," Jayachandran says. "These are really programs that should be run for perpetuity or at least a long time."